Adsense is the best way to earn revenue from your blog. It is the most general and almost the highest paying Ad Network. 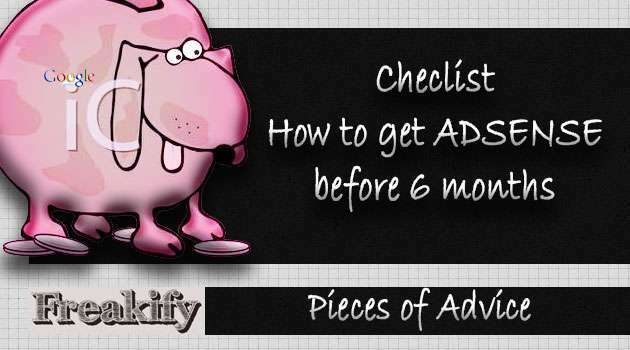 Recently, a lot of bloggers who are beginners end up asking the same question in a lot of forums, groups and discussion blogs that “Can I apply for Adsense before 6 months age of my blog?” To answer their quest to get monetary benefits from their blogs, I am today compiling a little checklist. All about How to get Adsense before 6 Months. Always follow your own rules, be more natural but all this after doing three things. One being the reading of Google Adsense Terms all by yourself, it will hardly take a day or two and you will know what is allowed and what isn’t. A set of 30 Quality articles with titles that are not present anywhere else, and the content they have claims being the most unique thing you can find over the air. A theme which is not so commonly used by others. Less design with more uniqueness. Clear Menu, each category or tag at menu filled with 5 to 10 articles. Images at home page with each article. Big and easily readable font (Use Google Fonts for customizing your site’s look and feel). Have you setup Google Plus, Twitter, Facebook and Pinterest account for your blog? Is your domain name good enough? Is it branded with some good thing? Catchy eh? Done with all of this? Now I think if you are getting nominal traffic (How to get traffic?) and you blog is getting indexed quickly(How to index my blog posts quickly?) then it’s the time for you to apply for and Adsense account. 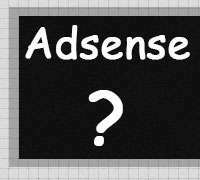 Still no guarantees of getting approval, but if you are disapproved don’t worry, you always have more chances to get your first account of Adsense. Still Thirsty? Geek? Want More? So, I guess you are still not satisfied with my checklist, there is something inside you that is asking you to read more do more research work, and make this shot a best shot, then Mairaj Peerzada, a young Entrepreneur & blogger, has compiled a list of 70 “Dumbest Blogging Mistakes” you’re likely to Commit. Go read it. Need to know that? What? Questions? Yes! Fine, ask theme here below, in comments and you will meet my 8 years experience of blogging, programming and designing in your answers.